Book Dedication: To my husband, David Yoon, who showed me my heart. This book l got for free as part of a goodreads giveaway and firstread l never won anything before but l want to say thank you to goodreads for having a great site and l want to say thank you to the person who hosted the giveaway and picking me as a winner. Synopsis: Madeline Whittier is allergic to the outside world. So allergic, in fact, that she has never left the house in all of her seventeen years. But when Olly moves in next door, and wants to talk to maddie, Tiny holes start to appear in the protective bubble her mother has built around her. Olly writes his IM address on a piece of paper, shows it at her window, and suddenly, a door opens. But Does maddie dare to step outside her comfort zone? Everything, Everything is about the thrill and heartbreak that happens when we break out of the shell to do crazy, sometimes death-defying things for love. I give all the stars in the sky to Nicola Yoon's sparkling debut everything, everything is everything, everything - powerful, lovely, heart-wrenching, and so absorbing l devoured it in one sitting. It is a wonder the rare novel that lifts and shatters and fills you all at once - Jennifer niven, Author of all the bright places. An absolute peach of a love story. Maddy's unique history of isolation and solitude makes every incremental step towards intimacy crackle with impossible hope. Their chemistry rebounds off the page and it is beautifully written, too with charm, wit and style as well as heart - Susie day, author of my invisible boyfriend. Review: This book was easy to get in to. I was hooked after reading the first page and l love the design on the cover it is very pretty and colourful. being a drunk. I really was sad to read that Olly was Punched in the stomach by his father who is suppose to look after him and make sure no harm comes to him. I highly recommend this book. I wish l could rate it more than 5 stars because it deserves more than the 5 stars l rated it. I would love to read more about Madeline and Olly . Carla sounds like a great friendly nurse unlike Madeline's new nurse. Carla is not only Madeline's Nurse but she's her friend too Carla wishes her daughter was like Madeline. But her mother fired Carla because she went against the rules and let a strange boy into the clean house and near Madeline. Madeline is allergic to everything in the world she lives in a clean house. It was nice to read that Madeline's mother give Madeline a picture of herself,her mother,her father and her brother on the beach in Hawaii. Madeline was only a baby in the picture she was being held by her mother. Madeline and Olly sounds like they would make a great couple. Madeline and Olly run away to Hawaii for two days. They buy presents for some of their family members. Olly got something for his mother and his sister. Madeline buys something for Carla and a postcard for her mother. I could happily read this book again and again. I can not put in to words how great this book is l would tell people to read it for themselves to know how great this book really is. I would tell people to step outside your comfort zone with books because it is good to add more authors and genres to your reading portfolio even if you do not read books like this. I am glad this book is on my bookshelf. I am really glad l have read this book. It must be hard for Madeline's Mother Pauline knowing she could lose her surviving child she would go to any lengths to keep Madeline safe from any danger. I would like to read more books from Nicola Yoon. I hope Olly's Father goes to jail for hitting Olly. I really enjoyed this story and book. It is nice that Madeline books because books take you away from your life. I wish Madeline and Olly get together as boyfriend and girlfriend. I was happy to read that Olly and Madeline made the most of their time together. Pauline Madeline's mother emailed Olly to asks about Madeline and she told her mother she was fine and she will see her soon. Pauline just wants her daughter where she knows she is safe and Olly's friend Zack knew that Madeline was lying about the tablets. He said he would not tell Olly because he had secrets of his own. one of my favorite authors has read this book and she loved it like l do. Hawaii sounds beautiful. I hope Madeline does not get ill and she does not die because her mother,Olly and Carla would be heartbroken. It would be hard for her mother if she has to bury another child. I am guessing she does not die which l am glad of. Madeline's mother is flying out to Hawaii to bring her home to the clean house. She loves Madeline and she does not want to lose another child. It was horrible to read that Madeline's father and brother died due to a car accident because the driver of the other car fell asleep at the wheel you should not drive when you are tired because this could happen. The doctor Madeline seen in Hawaii thinks she was never ill if she is not why would her mother keep her locked away from the outside world or is it that she is worried she is going to lose Madeline like she lost her husband and her son they both passed away on the same day in a car accident. I was happy to read that Olly,his mother and sister got away from his father and they was safe from him. A few months after they left Olly's father left the house with his belongings. Madeline hoped he was not going after Olly,his mother and sister. Olly's father is a drunk who hit his wife and son. I was happy to read that Madeline's mother Pauline hired Carla to be Madeline's nurse again. This book has 310 pages in it. I was sad to read that Madeline was not reading Olly's emails. This book has some really nice drawings. Madeline so wants to email Olly but she just makes drafts after drafts of what she wants to say. This is a good storyline. It was nice that Pauline was getting counselling to help her come to terms with the loss of her husband and son. About The Author: Nicola Yoon grew up in Jamaica (the island) and Brooklyn (part of long island). She currently resides in Los Angeles with her husband and daughter, both of whom she loves beyond all reason. 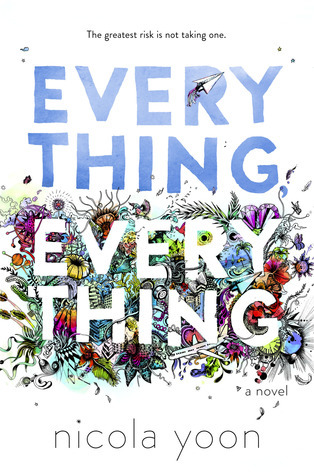 Everything,Everything is her first novel.